Just decades ago, buying software tools was a very different process. Do you remember buying the software on a CD-ROM to have it arrive in a plastic-wrapped box? Then loading the disc into your computer and waiting for the software to download. Today, it's all about SaaS, or Software as a Service. The process of buying and using software is very different. It’s likely you’ll purchase a software product, receive an invite via email, set up an account, then visit the website from your browser and log in. You’re probably paying month-by-month, or per user, or some combination of the two. And when the company releases an update? It’ll be right there waiting for you. This modern way of buying and accessing software is called SaaS, or software as a service. SaaS is the practice of accessing software solutions over the internet. Before SaaS, businesses and consumers would buy a physical version of the software that required installation. With software as a service, business and consumers subscribe to access software hosted externally. While no installation is typically required, some solutions, such as Slack, offer access via both a web browser and a desktop application. The software-as-a-service delivery model makes it easier to deploy software, push updates, and scale users. Traditionally, SaaS payment models operate on a pay-as-you-go or pay-as-you-use structure. In this guide, we’ll cover SaaS from the beginning – that’s right, all the way back to the 1960s. When you’re through here, you’ll have learned about the history of SaaS, buying best practices, key metrics, the SaaS business model, and much more. So, we should probably start with the basics. And if we’re going to give you a comprehensive SaaS resource, answering the question, “what is SaaS?” seems like a good place to start. SaaS is the commonly used acronym for software as a service. Which begs the question, what is software as a service? And how is it different than just plain software? SaaS is the practice of accessing software solutions over the internet, as opposed to by downloading solutions onto your computer. Before SaaS, businesses and consumers would buy a physical version of the software that required installation. Remember the plastic-wrapped boxes that held the software’s CD-ROM? Us too – they were a pain. SaaS eliminates the need for that thanks to the internet. Businesses and consumers simply subscribe to access externally hosted software. As long as they have a connection to Wi-Fi, they can access the software from anywhere, on any computer. Typically, SaaS tools don’t require any installation. However, some applications, like Slack, offer both a web browser version and a desktop application – both of which still require internet access. Desktop applications are convenient because the user will typically stay logged in as opposed to having to type in their username and password every time. The software-as-a-service model in itself has proved to be popular in software today, with the large majority of software companies selling a SaaS offering. SaaS alleviates a lot of the pain of deploying software, pushing updates, and scaling users, making it appealing to software companies and software users alike. The pay-as-you-go or pay-per-use structure also remains an invaluable aspect of the SaaS model. For users and companies buying the software, this can mean a lower initial investment, and the ability to avoid paying for a software package for your entire company when only one particular team will use it. For software companies, this grants them the opportunity to upsell throughout the customer lifecycle. It seems certain that the majority of software users would choose the SaaS model over returning to on-premise software, or software installed on a local computer. What is on-premise software? On-premise software is a traditional software model that is installed and ran on computers that belong to the individual or organization that owns the software, as opposed to running remotely on the cloud. If you spend just 10 minutes scrolling through your LinkedIn feed, it’s likely that you’ll see some article about the benefits of “working remotely,” and why being in the office Monday-to-Friday at 9:00 a.m. is quickly going out of style. In a business environment where remote work is becoming so commonplace, the ability to access your software from anywhere is vital to employees’ productivity and a company’s success. The ability to work from almost anywhere (anywhere with wifi, that is) isn’t the only benefit of SaaS. As we stated earlier, there’s typically a lower initial investment for the companies buying. Since you access SaaS via the internet, you don’t have to pay for any hardware to assist in implementation. Similarly, most SaaS products follow a similar pricing model – you pay for what you need. If you know that you’ll have 10 users working in this software per month, you don’t need to pay for the tool to support your company of 200 employees. Paying by the user can reduce costs significantly, and help you avoid shelling out cash for something you’re not going to use. Ask anybody about the downfalls of on-premise software, and they’ll probably give you an answer that has to do with the time and energy it took to set up. SaaS eliminates a headache with a speedy implementation. A quick set-up time also means a shorter time until you see benefits from the software. Quicker benefit means a quicker ROI and, to be honest, for any business that’s trying to turn a profit, that’s what matters. A near-effortless implementation also increases adoption rates, which are essential to getting the most for your money. If you’re paying a software company to have 15 users, you better have 15 employees ready to go once you roll out the tool. If not, you should be paying for less. For companies that are always looking for the latest and greatest version of a software tool, the SaaS model offers an additional benefit. With SaaS, all updates and new features are the responsibility of the vendor. Instead of having to install a new update every time one comes out, the feature will typically be live in your web-browser version almost immediately. This saves time and effort, and ensures that the user is getting the biggest bang for their buck. Additionally, SaaS tools often support integrations with different tools. Integrating your CRM with your marketing automation system, or your database to your e-commerce store, can speed up processes, eliminate the need to constantly switch between tools, and ultimately benefit your bottom line. However, like anything, SaaS still has its disadvantages. 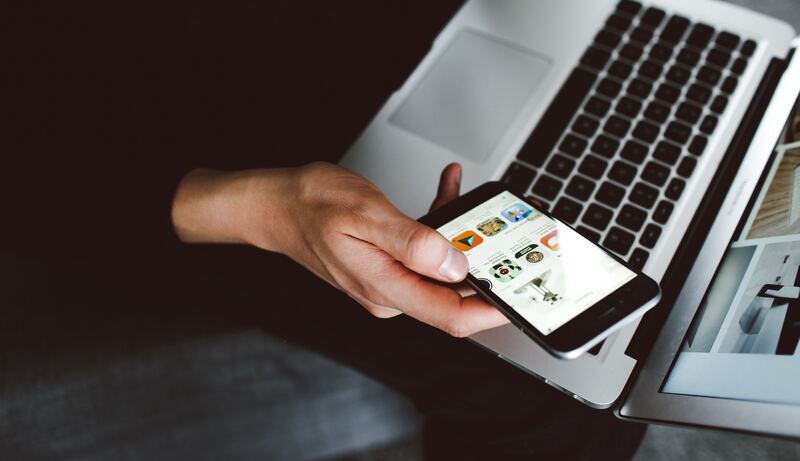 Although the ability to work from anywhere with Wi-Fi is often appreciated, the reliance on the internet does present issues. While it’s nice to be able to post up at a coffee shop every so often, your local Starbucks doesn’t always have the most reliable internet, which can negatively impact productivity and ultimately, keep you from getting your work done. And when you’re on a cross-country flight, your options are either pay for spotty, overpriced Wi-Fi or not use your SaaS tools (my editor adds as he transferred this rough draft from a Google Doc to a Word document while sitting in O’Hare). On the other hand, if you’re using traditional on-premise software to complete your day-to-day, such as Microsoft Excel, you’ll be able to continue your work even if the internet fails you (track changes still works at 30,000 feet, apparently). Additionally, as with anything that involves “the cloud,” security concerns around SaaS are typical. While the ability to work from anywhere is convenient, your employer may not be thrilled with the idea of accessing your businesses’ high-stakes contacts or data on an unsecured network. This article from NetworkWorld does a great job of highlighting SaaS security concerns that are worth considering. Regarding customization ability, SaaS has come a long way. Compared to the not-so-distant past, companies have plenty of integrations and modules to increase functionality, with more coming out every day. Companies increasingly opening up their APIs and creating developer kits has helped greatly in this regard. Still, though, the ability to customize software isn’t at the level of on-premise software quite yet. Lack of customization may not be a disadvantage for too much longer, but for now, it’s something to consider. With SaaS, it’s also worth considering your price over a lifetime. While the pay-as-you-go model seems cost effective at first because you’re avoiding a massive one-time fee, it could end up being more expensive. Most companies understand this when they purchase, but keep in mind that your software vendor will likely try to upsell you as you continue using their service. Plenty of software companies are switching from an on-premise to pay-as-you-go solution, but with change often comes period of adjustment. When Adobe switched from a one-time fee to a subscription model, their customers were less-than-thrilled. Although the barrier-to-entry is lower with a subscription model, their customers seemed to prefer the traditional model of pricing. SaaS, like anything else, has its pros and cons. When looking for a software solution, it’s important first to identify your companies needs – absolute necessities, nice-to-haves, and the features you don’t need – and evaluate SaaS vs. on-premise to determine which will better fit the bill and allow you to be successful. What do you think of when somebody says ‘software as a service’? It’s likely the first response of many is “Salesforce,” the SaaS giant turned household name with the help of market share and marketing expertise. And while software as a service has continued to gain popularity since the founding of Salesforce in 1999, it dates back to as early as the 1960s. It’s hard to believe – we know – considering SaaS today requires the internet and a web browser. But it’s true. SaaS practices did exist, but in a very different form than what we see today. What was then known as timesharing has evolved into the systems we recognize today. Timesharing was introduced in the 1960s due to companies’ limited ability to purchase one individual computer, much less multiple. Just like the newest iPhone always comes with a hefty price tag, the newest innovation of the era did as well. It’s as simple as this: computers were still in their relatively early stages, and that meant that they came at a price. And if the financial investment wasn’t enough to stop small and medium-sized businesses, the space investment may have been. Computers were enormous. We’re talking the size of an entire room. The majority of companies couldn’t afford or host their own computer – they simply didn’t have the resources. However, with enterprise companies shifting to computers to support their CRM and payroll functions, the little guys needed a way to stay relevant. With that need came “dumb terminals,” or a keyboard and monitor that weren’t hooked up to their own computer. Instead, multiple dumb terminals were hooked up to one computer, or the mainframe. This early form of connecting computers allowed employees to access applications and data from their own desks. The mainframe stored all of the apps and data. Input was received through the dumb terminal keyboard, and output was then sent to the dumb terminal monitor. This system was revolutionary and allowed small and medium-sized companies to access computer systems cost-effectively. Timesharing enabled these companies to stay competitive with the enterprises, even if they had a fraction of the resources. This system remained prevalent through the 70s and 80s as it continued to be the most cost-effective method. Most common systems pushed through this method were accounting, payroll, and CRM services – interestingly, some of the most popular SaaS categories today. The first major shift in SaaS history began in the late 80s and 90s. Computers shrunk in both size and cost. No longer were they exclusive to enterprise companies – small and medium-size businesses could afford their own. With this shift, the software tools stopped hosting themselves on a central computer and instead began to host on local area networks (LANs). By connecting to the LAN, employees were able to access their applications and data for use on their own monitors. With this, we saw the first IT departments. Companies began hiring “network managers.” Their key function was to oversee the computer operation. They would install new hardware, maintain the programs, and execute updates when necessary. In smaller companies, they could work alone. In larger companies, the network manager could evolve into a full-fledged IT department. The past truly made way for modern SaaS when employees began each having their own computers. At this point, they were required to host their own software products as opposed to accessing them via LANs. This was more similar to the CD-ROM software era we discussed in the intro. However, the smaller, individual computers meant less storage capacity – a shortcoming software developers would often exploit by including “bloatware” into their software. Bloatware is a word used for when software manufacturers include unwanted or unnecessary software in a package to be downloaded onto a computer. In addition to being unwanted, the software typically uses an excessive amount of storage, to the point that it becomes irrelevant. Even though computers were mainstream at this point, they still weren’t at their full functionality. Extra storage was expensive – we’re talking upwards-of-$2,000-per-computer expensive. Even the companies that did have the resources to give each employee an individual computer likely didn’t want to shell out $2,000 per person for extra hard drive space. However, what once was a definite hassle created a massive opportunity for a new kind of software vendor. At this point, we’ve reached the 90s, and we’re in the midst of the dot-com boom. Internet had become widely available. And software vendors jumped at it. Acknowledging that companies didn’t want to pay for extra hard drive space, they created software companies that lived on the internet and stored applications and business data on a central hub. This workaround enabled companies to avoid hefty storage costs, and so, SaaS was born. However, before the term SaaS was coined, a different industry followed this same model. This field was called the ASP industry, or application service provider industry. ASPs followed a very similar model to today’s SaaS vendors, with a few differences. The first differentiating factor is that ASPs hosted and implemented business applications by third-party vendors. On the other hand, SaaS vendors created their own. As far as functionalities, they were more or less the same. ASP and SaaS vendors both offered a software service available via the cloud, typically following a pay-as-you-go model. Unfortunately, ASP vendors struggled with scalability, ultimately creating their own demise. So, while ASP vendors slowly trickled out, SaaS vendors continued to gain traction. In fact, the term SaaS was first coined in 2000 by the Software & Information Industry Association. Around this time, the first SaaS company evolved. We use the term “evolved” because, unlike SaaS-giant Salesforce, Concur, the company typically referred to as the first SaaS company, did not start as one. Instead, it sold packaged software – you know, the plastic-wrapped boxes with the CD-ROM – when it was founded in 1995. Its first model switch was when it began selling software licenses directly to enterprises. After 2001, Concur rebranded again and became a pure SaaS business. In 2014, Concur sold to SAP for $8.3 billion. SaaS today looks very different than when it required an entire IT team to maintain it. In fact, it’s likely that the majority of software you use at work are SaaS products or have some SaaS offerings. Products like Salesforce, HubSpot, and even Gmail continue to adapt and shape the way that we see software as a service today. As we discussed, SaaS, or some form of it, has been an office staple since as early as the 1960s. Business professionals were able to access applications and services from their own monitors with the help of a local area network and a dedicated IT professional. Today, SaaS in the workplace is the new normal. The majority of software tools and applications are accessed over the internet with employees simply needing a personal username and password. This has become exceedingly popular due to its accessibility, pricing structure, and lack of storage space required. If you work in an office setting, you’re likely familiar with software as a service and can even name the SaaS tools you use regularly. Whether it’s a CRM system, payroll tool, or the platform you use to communicate with your team, business-to-business SaaS (B2B SaaS) is a familiar term and space. While there are tens of thousands of B2B SaaS tools out there (a number that grows every day), there are some that are relatively well known to both business professionals and everyday consumers. Some of the most well-known B2B SaaS tools are products like Salesforce CRM, HubSpot, and Expensify. These particular products have built up a significant market share and social presence – so much so, that even professionals that don’t use the tool have likely heard of them. HubSpot is an example of a B2B SaaS tool with a particularly consumer-geared social media presence. However, even though it is widely known among consumers, HubSpot’s offerings are still business specific. On the other hand, if you asked an everyday consumer or a student an example of SaaS that they use, they may not be able to give you one. That’s not to say they’re not using it – it’s nearly impossible not to be. However, consumers rarely consider the tools and applications they use every day to be SaaS. They’re just a part of life. Business-to-consumer SaaS (B2C SaaS) products are usually household names. Things like Netflix, Spotify, and even Amazon Prime can be considered B2C SaaS. These products are accessible via the internet and follow a SaaS pricing model, but are entirely geared toward consumers instead of businesses. These products are used recreationally as opposed to at work (and as much as we would all love to watch Netflix at the office, we, unfortunately, can’t recommend it). Then, there are the SaaS tools that are used by both businesses and consumers. These products typically offer different functionalities dependent on the user. Sometimes, the B2B and B2C offerings are the same, with the only difference being the way that the user utilizes the tool. Some examples of these tools would be Grammarly, Slack, or DropBox. While tons of companies use Slack (and we mean tons – it’s the most reviewed product on G2 Crowd), its free offering is great for clubs, class projects, or just groups of people that want to keep in contact. Typically, these cross-functional products offer different pricing models and functionalities depending on who’s buying. So, we’ve highlighted some examples of B2B vs. B2C software, but what makes them different? Believe it or not, the differences are more than just that last letter in their names. Let’s point out the obvious – the primary difference between the two types of SaaS is the audience for which they're intended. B2B SaaS serves a business audience and is used by professionals, whereas B2C SaaS serves a consumer audience and is used by, well, everybody. SaaS has become so popular among consumers because a subscription pricing model is very appealing. Instead of making multiple one-time purchases, they can sign up for a month-by-month or yearly plan, enter their credit card information, and then it’s out of their mind. For example, let’s look at music streaming service Spotify, one of the most common and most popular B2C SaaS products. Like many B2B SaaS products, Spotify does offer a free model. However, music listeners gain significantly more features when they upgrade to Spotify Premium for $9.99 per month. Upgrading eliminates ads, offers unlimited song skips, features high-quality audio, and more. 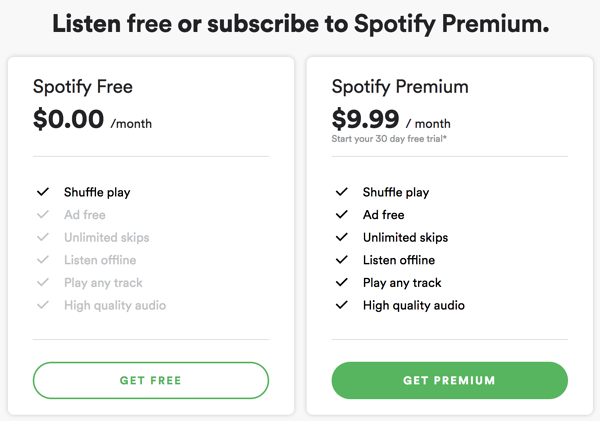 Spotify replaced the previous model of buying music by the song or by the album and instead offered unlimited music to listeners for just dollars per month. With few exceptions, users can access any artist, song, or album at the touch of a button. Spotify is one of the SaaS tools that offers both a web-browser version and a downloadable desktop application. Spotify shares many characteristics with B2B SaaS, including its pricing model, accessibility, and speedy implementation time. What truly differentiates it as a consumer product is the cost itself (relatively low), its intended audience (price is per month as opposed to per-user/per month – it’s geared toward individuals, not groups), and its marketing efforts. The efforts of B2C SaaS marketing teams have more in common with other consumer products than with B2B SaaS tools. While B2B SaaS marketing focuses heavily on specific accounts and key stakeholders (we’ll dig more into account-based marketing later), B2C SaaS marketing is all about brand awareness. B2C SaaS products are household names – Spotify, Netflix, even Amazon Prime. And you’ll see significantly more traditional advertising (think billboards, commercials, etc.) for those companies than for a CRM software tool. For example, this Amazon Prime commercial shares characteristics with any other consumer product. Aside from being pretty stinkin’ cute, it tugs at the heartstrings a bit and is quite memorable. On the other hand, B2B SaaS tools typically focus on account-based marketing and tailor their marketing efforts to the individual or group to whom they’re trying to sell. While there are successful B2C and B2B SaaS tools, we’re going to highlight two of the industry’s biggest success stories. Since its launch in 2008, Spotify has become a household name and a must-have for music aficionados. Spotify sold itself as an alternative to buying physical CDs (at $15 a piece), illegally downloading individual songs from LimeWire (does that still exist? ), and shelling out $1.39 per song from iTunes (it adds up!). The company quickly gained popularity, especially among millennials, who embraced both Spotify’s freemium and subscription models. So just what is Spotify and, more importantly, how did it disrupt the way that consumers have bought music for decades? Founded in Sweden in 2006 and launched in 2008, Spotify is a music and podcast provider that allows users to stream music via the cloud without downloading individual songs. However, the tech startup turned household name kept U.S. consumers waiting with a U.S. release date on July 14, 2011, nearly three years after its original launch. Today, Spotify has 18 offices around the world to support its New York City headquarters.The music provider received its first round of funding in October 2008 – a $21.6 million series A round led by Creandum and Northzone. Since, it has secured additional rounds ranging from $50 million to $1 billion, and went public April 3, 2018, with an IPO share price of $165.90. Spotify is accessible nearly anywhere one has internet, with availability in 65 countries. Like well-known business SaaS tool Slack, Spotify offers a web browser version, a desktop version, and a mobile app. The tool caters to the consumer well, with additional access via home entertainment systems, cars, and more. Spotify’s subscription model has grown exceedingly popular and currently hosts more than 70 million subscribers. The massive audience is understandable – depending on the way consumers previously bought music, paying for the premium access likely seems like a bargain. For $9.99 per month (fewer than 10 songs on iTunes, or approximately two-thirds of a CD), listeners have access to Spotify’s more than 35 million songs, with zero advertisements, high-quality sound, and additional features. Subscribers make up around 31 percent of Spotify’s total users, with 157 million active listeners utilizing the free version. Similarly to SaaS tools and their popularity in the business world, Spotify was appealing to consumers for a variety of reasons. Spotify is affordable, user-friendly, and most importantly, innovative. It is constantly adding new songs, featuring new artists, and compiling custom playlists based on listeners’ interests and previous song selections. By simply typing into a search bar, listeners can access almost any song they want, including the country’s top 50 songs, 90s hits, movie scores, Broadway soundtracks, and more. Spotify also features stand-up comedy, favored podcasts, and more. With the paid version, users can listen ad-free, utilize shuffle play, skip songs they don’t like, and download songs for offline listening when they no longer have access to Wi-Fi. It’s easy to get behind companies that disrupt an industry. While their offering is typically better than anything else available, it’s also exciting to follow along and be an early adopter. For consumers, SaaS tools have just recently begun to gain popularity, with websites like Spotify and Netflix taking an early lead. As consumers begin to embrace this model, it begs the question – what industry is next? You can’t write a comprehensive guide to software as a service without mentioning industry giant Salesforce. While Salesforce.com (SFDC) wasn’t technically the first SaaS tool, it is almost certainly the most well known, with business professionals and consumers alike likely recognizing the blue cloud. Since its founding in 1999 and launch in 2000, Salesforce has embraced its “no software” promise and continued offering some of the most innovative solutions in tech. Salesforce began as a customer relationship management (CRM) tool. While not the first of its kind, what made the company’s offering so innovative was that the solution was accessed entirely over the internet. CEO and founder Marc Benioff envisioned a business software tool similar to the offerings of Amazon.com, with the mission of making business software tools as user-friendly as consumer sites. Customers were quick to embrace this model due to its low initial costs, subscription model, and simple implementation. Early success paved the way for its future, with Salesforce being recognized by Forbes as the World’s Most Innovative Company consecutively from 2011 to 2014. In 1999, Benioff was a visionary. Today, the majority of software companies have followed suit, with almost all offering exclusively cloud-based solutions and likely abandoning on-premise software. Salesforce itself has continued to grow, and the San Francisco-headquartered company now has 49 offices all around the world, including 14 U.S. cities and locations in Europe, Asia, Australia, Africa, the Middle East, and Latin America. Salesforce is also publicly traded on the New York Stock Exchange with the clever symbol CRM. No longer limited to CRM software, Salesforce has made 51 acquisitions since its founding and now offers tools in various other industries, including marketing, community management, analytics, commerce, and more. In addition to paving the way for SaaS tools, the tech giant has consistently been commended for its company culture and philanthropic initiatives. Salesforce CEO Marc Benioff coined the “1-1-1 philanthropic model” – the act of every year pledging one percent of its product, one percent of its resources, and one percent of its time to charitable initiatives. And just like you can’t comprehensively cover software as a service without Salesforce, you can’t comprehensively cover Salesforce without featuring the gold standard of professional conferences, Dreamforce. Since 2003, Salesforce has brought together tech giants, small businesses, and everything in between to what has become the largest tech event in the industry by a substantial margin. In its earliest stages, Dreamforce was a modest conference held at a hotel in San Francisco. Today, it takes over the Bay Area with more than 170,000 attendees visiting 2017’s event. Every year, Dreamforce serves as the unveiling of Salesforce’s latest innovations, ensuring its prominence as a tech giant. Additionally, over the years the conference has hosted notable speakers such as former president Bill Clinton, Facebook COO Sheryl Sandberg, former first lady Michelle Obama, and, of course, Marc Benioff himself. Today, Salesforce continues to grow and recently dominated the San Francisco skyline with its new 1.4 million square-feet, 61-story building. The skyscraper features 360-degree views of the Bay Area and will continue to host Salesforce’s San Francisco headquarters for the foreseeable future. Sometimes you’ll immediately realize that you need a software tool. For example, most businesses with an experienced leadership team understand the need for and importance of their CRM software, or their payroll tool. On the other hand, sometimes, a minor inconvenience will nag at you every day of the week until you finally throw up your hands and think, “there has to be a better way!” Whether you’re sick of your employees having to update their own email signature, using mass BCCs to send out your customer newsletter, or a lack of employee interaction on your social media posts, you’ll likely begin your search for a better solution. However you realize your problem, that’s the first step of your SaaS purchasing process: determining the need. In the situations we referenced above, you understood your problem before you know the actual type of solution for which you’re looking. Maybe you don’t even know that you’re looking for a software product! Sometimes, a simple piece of advice from a professional or a “life-hack” can be enough to solve your workplace problems. But sometimes, that won’t be enough. You’ll run a quick Google search of “how to record a video call” or “how to send a mass email,” and suddenly your screen is flooded with choices of different software tools. Typically, this is where you’ll realize the type of software you need to solve the problem. This point is usually where your search gets difficult. In each software category, there’s a plethora of different products and tools that may be a great, or not-so-great, fit for your company. Before you move on in selecting a tool, you’ll need to nail down your requirements for the solution. You’ll want to be explicit here and listen to opinions from multiple people within your company. Sit down and ask yourself – what are the goals when using your tool? It’s time to nail down your requirements and compile a list of all of the tasks you’ll need this software to help you accomplish. While it’s important to get the input of your leadership, it’s equally as important (if not more) to seek opinions from those employees that will be using the SaaS tool. Additionally, this is an excellent opportunity to empower those employees with the responsibility to assist in this decision. Ask them the features they would like to see in a software tool, prompt them to do their own research, and encourage them to sign up for a free trial. After a week or two (or whatever your turnaround time may be), meet again to compare notes and discuss pros and cons. If a team member feels particularly strongly for (or against) a tool, allow them to compile their findings and present them to the decision-makers. And while we’re on the subject of research, you’ll want to do it – lots of it. Today, there’s more information available on SaaS products than ever before, with new articles, reviews, and insights popping up on the internet every day. In fact, you can likely become almost entirely informed on different SaaS products before ever even visiting the vendor website. There are a few different methods we recommend for research. You’ll probably hear these and think they sound similar to how you research everyday consumer products. Well, that’s because they are! Buying SaaS has changed – it no longer requires listening to pitch after pitch from software vendors. Instead, you’ll research SaaS similarly to how you’d choose a hotel, pick a restaurant, or decide on a kitchen gadget from Amazon.com. For example, asking your peers or professional network can be a valuable resource when purchasing a new software tool. If you have any friends, old coworkers, or even LinkedIn connections who work in a similar industry and company size, don’t be afraid to reach out to them and hear about the tool they’re using in this situation. They’ll likely be more than happy to give a recommendation (or share their frustrations with you). You can also visit vendor websites and sign up for free trials if they have them available. Free trials can be a helpful resource for the employees who are being empowered to find a new software tool. We wouldn’t recommend asking your decision-maker to sign up for umpteen free trials (probably not the best use of their time), but if you have a few employees working together to find a solution, having them each sign up for one and test it out could be a valuable use of time. And finally, (and we have to throw this one in here), read reviews. 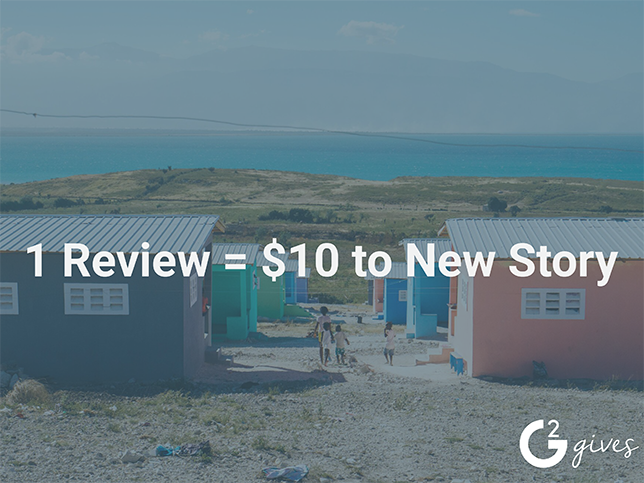 There are hundreds of thousands of software reviews out there covering various products – all of which you can read, totally for free, on review platforms like G2 Crowd. These will give you an unbiased look at what real customers thought of their experiences with the product you’re considering. On G2 Crowd, you can even filter the reviews to only show reviews written by somebody in a similar industry, user role, or company size. This is more than just a shameless plug – ask almost anybody in the industry, and they’ll speak to the value that user reviews hold. Reviews give you a glimpse at the good, the not-so-good, the wins, and the losses of users who have been there. Research is time consuming, we know – especially when you could just choose a vendor without really looking into it. But we couldn’t discourage that more. You’ll see the best results from your software when your employees actually use it, and you’ll see the highest implementation rates when you select the software that will really work for you and your business. Research and education will pay off in the end. Buying software that won’t work for you is a waste of money, time, and efforts. On the other hand, buying a software product that works, the first time, will give you well-deserved accolades and, ultimately, benefit your business’ bottom-line. After your research, you’ll likely begin to engage vendors (if you haven’t already through a free trial). Hopefully, due to the insights you found, you’ll already have a pretty good idea of which solutions will work for you, and which ones you can pass on. Regardless of what you’ve found, we suggest keeping an open mind, as this is typically the stage where you’ll learn about pricing, potential discounts, the implementation process, and more. As you discuss with vendors, keep a few things in mind. You’re in the driver’s seat, so make sure they’re telling you how their software will help you achieve your goals. When you tell them how you plan to use the software, they should be ensuring that you have reasonable expectations, and even give you some more tips and tricks. Remember the most critical word in software as a service: service. Your account executive, implementation specialist, and others make up the team that you’ll be working with for the foreseeable future, so make sure you feel comfortable that they’ll be working for you. Buying software is a robust process – even uncomfortable, sometimes. But doing the research and checking off your boxes will pay off in the end. It’s no secret that the SaaS business model has become exceedingly popular – it’s actually quite obvious considering the past 10 years have seen countless software companies transitioning from an on-premise tool to the cloud. So just how does this model operate, and what is it that makes it so appealing to software companies? This chapter will cover a general overview of the business model, the relevant metrics, and SaaS business practices. As we’ve mentioned, SaaS tools operate under a “pay-as-you-go” model. Typically, you’ll see pricing based on the number of users, amount of the tool used (such as storage space), or even just a flat rate paid month-by-month. This specific pricing model is so unique because it can simultaneously save money for the customer and create steady revenue for the software company itself. While on-premise software options required a significant payment at the original time of sale, SaaS companies receive more modest payments throughout the lifecycle of their customer relationships. This steady revenue allows them to continue providing service to the customer and creates opportunities to upsell. Below, we’ve featured Salesforce’s pricing model for its CRM tool. Like many business and consumer SaaS tools, it has different tiers that offer differing features and functionality. This product is priced per user per month. You’ll see that for the first tier, which is the least comprehensive, it costs $25 per user per month. This model is ideal for small businesses with just a few heads using certain software tools. With limited resources, it doesn’t make sense to pay for a large software package when only five employees are using the software, so this model enables companies to pay solely for what they're using. 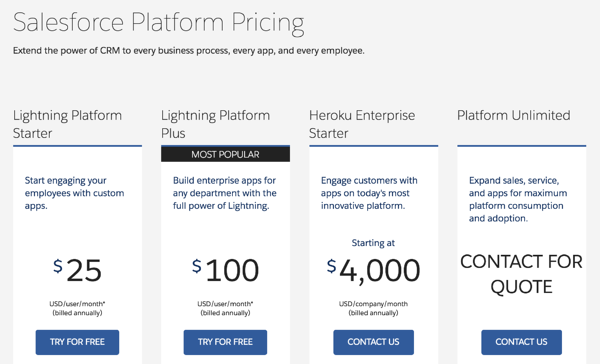 On the other hand, when you get to the Heroku Enterprise Starter tier, the pricing model shifts from per user to per company, with the price being $4,000 per company per month. This model is likely better for enterprise companies that will have such a large number of people using the tool that paying for an entire package makes more sense financially. When selecting a software tool, it’s important to look at more than just the price. Your company size, financial resources, and the number of employees using the software are all key in determining the option that’s right for your team. Like any industry, the software-as-a-service space is ripe with jargon. In the following paragraphs, we’ll review the essential metrics for a SaaS business and what they mean. Churn Rate: The churn rate is a necessary metric for SaaS companies to keep track of – simply, it’s the percentage of customers that leave. Calculating churn rate is essential for software companies to understand where they may need to make up for lost revenue, but, ultimately, it’s an indicator of how happy their customers are. SaaS companies take all of the customers they lose during a specified time frame (monthly, quarterly, annually, etc.) and divide by the total number of customers they had at the beginning of that time frame to calculate churn rate. The next two metrics fit hand-in-hand. The annual recurring revenue (ARR) and the monthly recurring revenue (MRR) are both the value of the income that the software company knows they will receive by you over a set period. Annual Recurring Revenue (ARR): Annual recurring revenue (ARR) is different than revenue in that it only includes regular, steady revenue – basically, what the company knows it will receive from its clients on an annual basis. Because of that, it typically excludes implementation fees, one-time fees, etc. While this is a useful metric to know, it’s not nearly as relevant as its similar counterpart, monthly recurring revenue, due to most SaaS companies operating with monthly subscriptions versus yearly. Monthly Recurring Revenue (MRR): Monthly recurring revenue (MRR) is likely the most critical metric for SaaS companies, or any company operating on a monthly subscription basis. Similar to ARR, this metric includes the amount of income the company receives on a monthly basis, or around every 30 days. Calculating this is simple – the SaaS company just needs to add together its MRR from each customer to find the total MRR. The following metric is essential for companies operating on a subscription basis and is often used for projections. The lifetime value of a customer (LTV) can give SaaS companies an estimate of how much revenue a customer will generate over the time of their relationship with the company. The final metric we’ll review is interesting to see from a buyer standpoint, as you’ll get a bit of insight into how much SaaS companies calculate the cost to obtain you as a customer. The customer acquisition cost (CAC) is an average estimate of what they’re spending to acquire each customer. Customer Acquisition Cost (CAC): The SaaS company divides the total marketing expenses spent on acquiring new customers by the number of customers actually acquired, over the period that the money was spent to find the customer acquisition cost (CAC). Marketing efforts can include costs like social spend, direct mail campaigns, and more. As a simple example, if a company spends $10,000 in one month on marketing expenses, and acquires 10 new customers in that same month, the CAC is $1,000 per customer. As a SaaS customer, a basic understanding of industry jargon will likely smooth your purchasing process and give you better insight into your spending. The above metrics are valuable to know in discussions with SaaS professionals and your own colleagues. Be aware there are many more metrics to be aware of, such as PQLs, and those working in and with SaaS should be well versed in all industry jargon. Within the realm of cloud computing, there are multiple related terms and services. In fact, SaaS is just one of the three related service models, with the other two being infrastructure as a service (IaaS) and platform as a service (PaaS). Before we get into the three service models, we’ll answer the most crucial question: What actually is cloud computing? In its most basic form, cloud computing means that hardware and software you use at work is provided to you as a service by another company. You access it via the internet (or in this case, what’s known as “the cloud”), as opposed to the services living on your own company's network or devices. The three service models of cloud computing (SaaS, PaaS, and IaaS) are differentiated by the amount of service provided and managed by the third-party and, accordingly, the amount of customization and capabilities your own team has. Let’s dig into it a bit more. IaaS, PaaS, and SaaS are terms often heard together, but what do they really mean, and how do they compare to each other? According to The Complete Guide to Software as a Service by Robert Michon, all three of the models share five essential characteristics of cloud computing. The five components are on-demand self-service, broad network access, resource pooling, rapid elasticity, and measured service. On-demand self-service essentially means that the end user (the customer) can add or remove services themselves and customize their tool. On-demand self-service eliminates the need for a technical support person from the provider. Broad network access is the ability to access the resources from the cloud via multiple devices, including but not limited to computers (Macs and PCs), tablets, and mobile phones. Resource pooling means that the service (whether it’s IaaS, PaaS, or SaaS) is partitioned over multiple locations to avoid unnecessary stress on one server. Rapid elasticity sounds more complicated than it is. All rapid elasticity means is that the system can adapt to increased or decreased workloads without stopping or slowing down. Measured services is one that we've covered – all this means is that these three types of services follow the pay-as-you-go model. But now that we’ve covered their similarities, let’s go into what actually matters, and that’s what makes them different. On a high-level, what differentiates IaaS, PaaS, and SaaS are the amount of work outsourced – what the service provider controls versus what the customer controls – and which roles at the customer’s company use each service. Infrastructure as a service (IaaS) providers deliver the foundational components of your company’s stack. Compared to PaaS or SaaS, the fewest functions are managed by an IaaS provider. Your company (usually your IT pros) manage applications, data, runtime, middleware, and OS, while the IaaS vendor provides virtualization, servers, storage, and network. IaaS sits at the bottom of a business’s stack, the group of programs they use to work toward their business goals. It allows your company to build, purchase, or deploy your PaaS on top of it. IaaS solutions are ideal for smaller businesses hoping to avoid the burdens that come with in-house IT infrastructure, including its cost and heavy maintenance. This model is also perfect for growth companies, as they can purchase additional infrastructure as needed to scale through the pay-as-you-go model. Platform as a service (PaaS) tools are slightly more comprehensive than IaaS, meaning the provider manages more and your company’s team (in this case, your developers), manage fewer. With PaaS, your developers manage application development, application maintenance and data, while the provider maintains runtime, middleware, O/S, virtualization, servers, storage, and networking (the back-end tools). PaaS offers a highly customizable platform on which applications are built and powered. Your PaaS will sit on top of your IaaS. Companies then release their services, software, or applications through this PaaS tool. Software as a service (SaaS) is the most comprehensive and disengaged of the three. In fact, the majority of your employees likely use SaaS tools in some capacity. SaaS solutions include most applications delivered over the web that has a more specific purpose. In his book, Michon references an excellent analogy that compares cloud computing to transportation. The transport analogy compares IaaS to the interstate highway system (its roads, bridges, and tunnels), PaaS to the cars, trucks, and buses that run on the highways, and SaaS to the actual transportation of people and goods. The highway system – the roads, the bridges, and the tunnels – alone, does nothing more than enable the transportation. However, without it, the transportation would be nearly impossible. The cars, trucks, and buses (representing PaaS) are additional enablers. Their purpose is to enable the transferring of people and goods from one point to another. The actual transportation of those people and goods is representative of SaaS. This level is where business activities happen, as is the software as a service layer in your company’s stack. Since its early beginnings, the SaaS industry has continued to grow, evolve, and thrive. It’s an equal-opportunity industry, with SaaS tools coming from startups, tech giants, and every company size in between. Even traditional software companies now have SaaS offerings to stay relevant and on-trend. Some of the most significant companies with SaaS offerings include Salesforce, Microsoft, Oracle, SAP, and Adobe. This mix contains companies that primarily offered SaaS tools from the beginning, and traditional companies that have transitioned from entirely on-premise options to a balanced blend of the two. The SaaS industry is also home to quite a few unicorns (private companies valued at $1 billion or more). While the tech sector dominates lists of unicorns in general, SaaS tools are beginning to gain more and more real estate. Some SaaS companies with unicorn status are Dropbox, Domo, and, of course, Slack. Dropbox, which was founded in 2007, was one of the early adopters of the cloud computing space. The San Francisco-headquartered company is a content management tool that enables teams to share and store files in one convenient location. Domo, a company that specializes in business intelligence and data visualization SaaS products, is a unicorn headquartered not in Silicon Valley, but in American Fork, Utah. It was founded in 2010 by Josh James, who still serves as CEO today. Slack, the team collaboration tool with nearly $800 million in funding as of April 2018, was founded in 2009 by Cal Henderson, Eric Costello, Serguei Mourachov, and Stewart Butterfield. The San Francisco-headquartered tool boasts various integrations to other software tools, and a strong customer base with companies like Airbnb, Target, and Oracle among the mix. It’s likely that we’ll see even more SaaS unicorns as the cloud computing space continues to grow. In the first half of 2017, the public cloud services market (SaaS, IaaS, and PaaS) increased 28.6 percent, according to IDC as reported by ZDNet. In the future, SaaS companies are expected to adapt their offerings based on significant tech trends. For example, artificial intelligence is likely to play a major role as SaaS companies begin to incorporate AI into their tools, ultimately increasing functionality and improving the user experience. Artificial intelligence is often seen in the form of chatbots, but it will also be useful in automating manual tasks and personalizing SaaS offerings. Cybersecurity is also a vital aspect of the future of SaaS. There is always a risk to storing sensitive data in the cloud, but consumers’ concerns and hesitations have pushed SaaS companies to take necessary security measures. These enhancements are formulated through encryption algorithms, identify management, and anti-malware – three measures that work to protect software, and its customers, from data breaches and viruses. The future of SaaS is exciting, no doubt about it. It will be interesting to see which companies can incorporate recent tech trends to stay relevant, and which will fall behind. Thanks for sticking with us – we covered a lot. From the introduction until now, you’ve learned about the history and future of SaaS, buying best practices, the difference between B2B and B2C, important metrics, key terms, and more. SaaS is a complicated space – the acronym alone is enough to cause some confusion. We hope that this guide leaves you informed and ready to use and discuss SaaS in a professional capacity. And just like the world of SaaS is ever-changing, so is this guide! Be sure to check back for updates, new chapters, additional resources, and more.